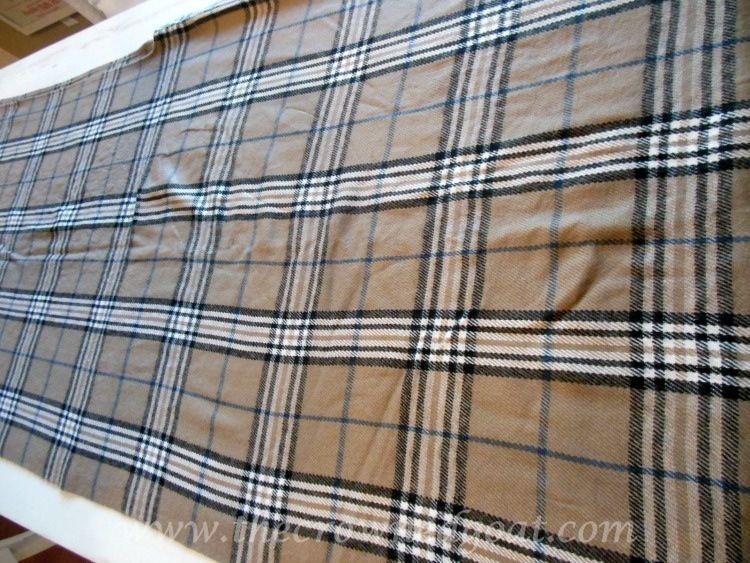 This table runner is actually a blanket that I used outside for my fall porch. I found it while shopping with my Mom one day and it has become the inspiration for both my fall and winter holiday color palate. 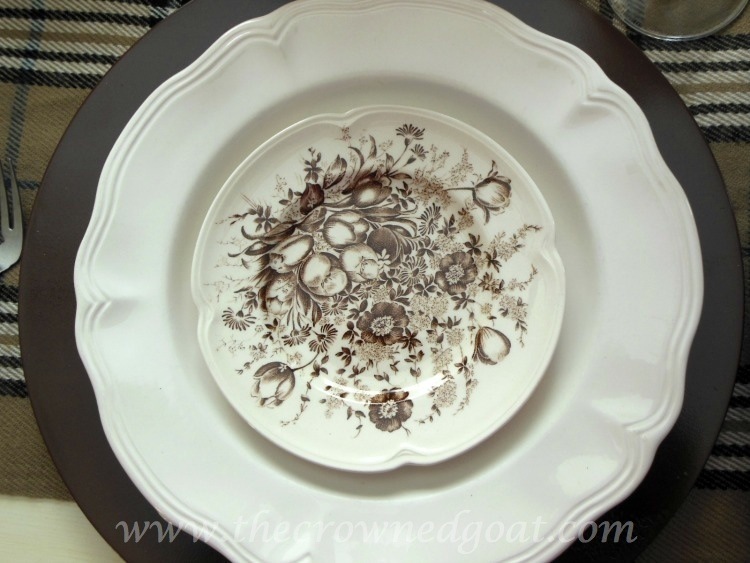 Of course, I had to use one of my favorite combinations – transferware and ironstone. My Mom and I also found these feathers and glass cloches while out shopping over the summer. They’re going to make a great place card holder. 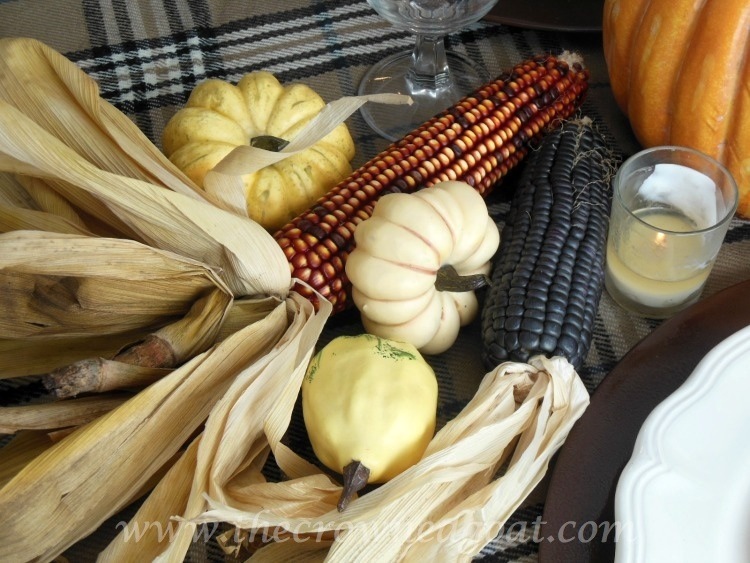 I used the corn that was part of the front door vignette as well as the gourds and pumpkins that were all from the fall inspired front porch. I’ve had these lanterns forever. They’re hanging from the trees during the spring or lining the driveway during our summer parties. 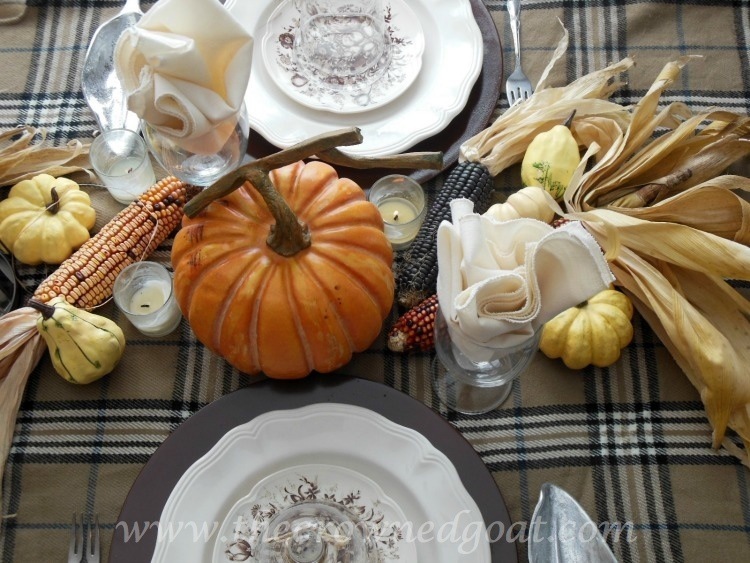 Thanks to the finds on the treasure trail and reusing items from the fall front porch this Thanksgiving inspired table was easy to put together. I hope it will give you some new ideas so you can use items you already have at your house too! 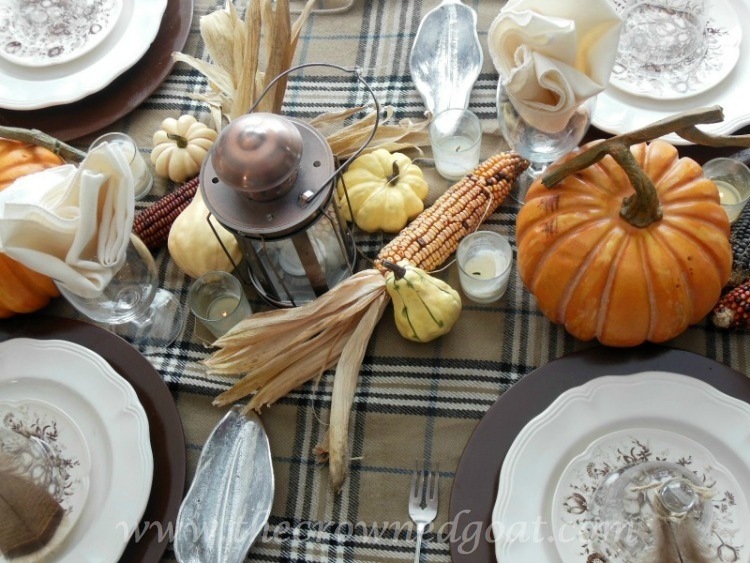 Hey CoCo – I love this tablescape. Your transferware is swoon worthy – so pretty. 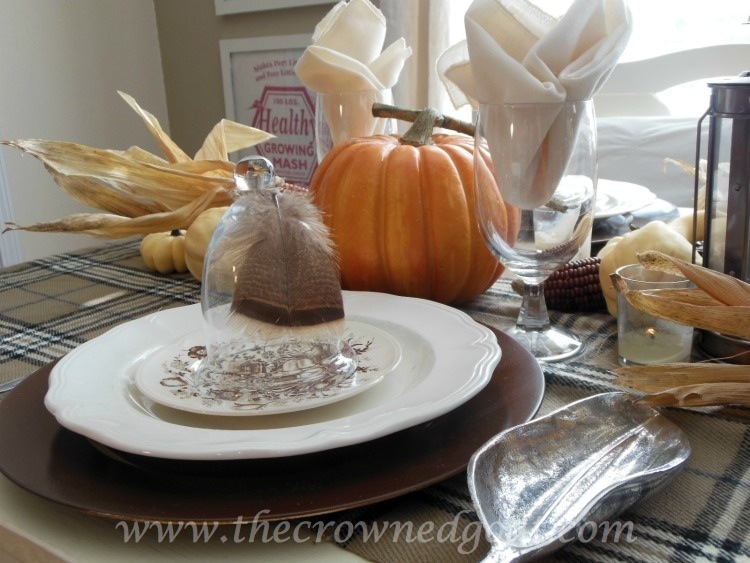 I especially love the cloches – they are so fun to decorate with. Thanks for the inspiration for me to change things up! Beautiful! Those little cloches are a great find! I was able to find 8 of those cloches, is that crazy or what! I love them too! You’re really sweet to say so Liz, thank you! This table is definitely one of my favorites from the season! I love everything about your table. The transferware is beautiful along with the cloches and feathers. Well done my friend. Thanks so much Renee those were some of my favorite items as well! I really appreciate it Bobbi, thank you! You’re so kind, Lisa, thank you! I love the silver leaves …. they will sell quickly, I don’t know how you are able to turn loose of all the treasures you find I would end up with barns built full of my goodies !!!! You know I love all things plaid. 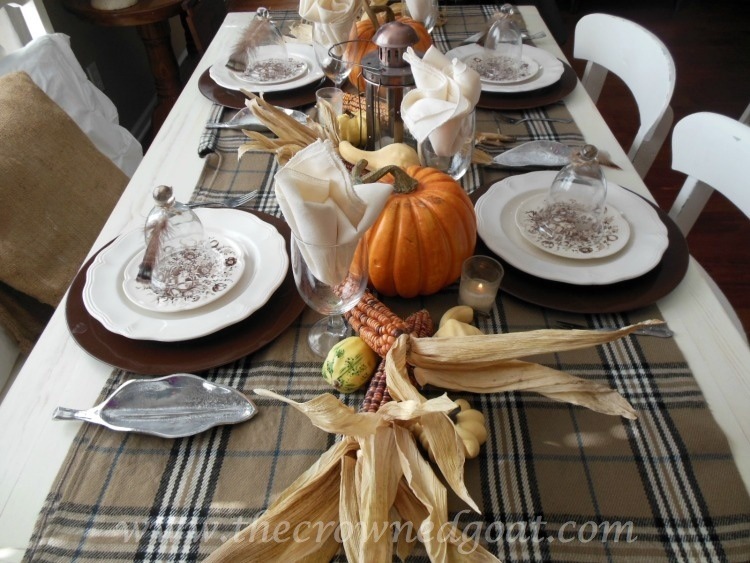 What a great and easy going table setting. Everyone is coming to my house this year. I am so stealing some of your ideas! This was definitely one of my favorite tablescapes of the entire season Nancy! Hope you have a great time planning for your family!